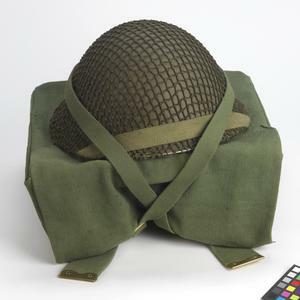 Helmet & net 'Turtle shell' shaped steel helmet, painted olive green and fitted with a removable string 'scrim' net. 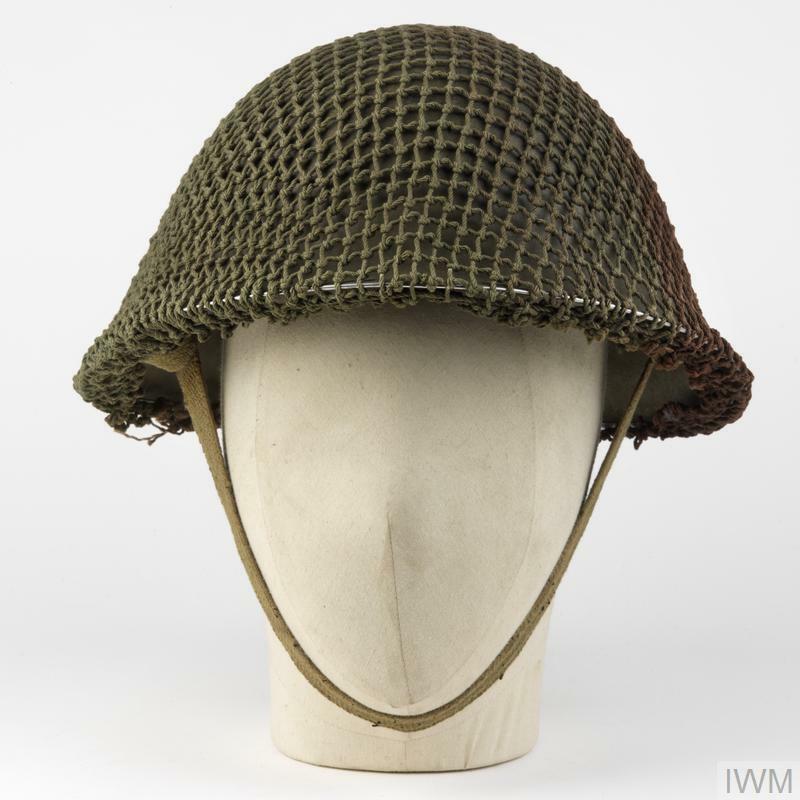 Produced from November, 1943, the MKIII helmet was first issued to assault troops of the British 3rd Infantry Division and Canadian army personnel in time for the Invasion of Normandy (often referred to as the 1944 pattern helmet). 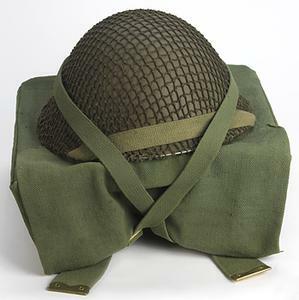 Although this helmet was to replace the MKII, substantial quantities of the older helmet remained in service even after the end of the Second World War. The MkIII retained a lining system that was fixed by a single screw through the crown, the later MK IV type featured one that was detachable by a 'lift the dot' principle. This modification meant that the basic steel helmet shell could be used as a basin if required, if indeed it was at all. Later, from 1959, a different type of lining system was adopted, replacing the familiar black oilskin cloth and rubber pattern, being replaced with a three part liner. The three-part consisted of a flexible multi-armed orange-brown fibre cradle, a sponge-lined crown, and an elasticated khaki stocking. When assembled, the stocking fitted over the sponge crown which in turn was connected to the cradle by press-studs, the cradle then pressed onto an inverted post located at the centre of the helmet shell via a sprung 'lift the dot' metal fixing. This system was the last in a long line of uncomfortable liners used by the British Army and possibly the worst. Those that wore the helmet have unhappy memories of it bouncing on the wearer's head when running and of the constant itching to the scalp that was caused by the sponge and elasticated stocking liner as it rubbed on the head. However, despite its problems the helmet remained with all three Services and was used until finally replaced by the GS Combat Helmet in the mid-1980s.